Thanks! We'll notify you as soon as this item is in stock. The DEFINE & HIGHLIGHT DUO is designed with 2 brushes to naturally sculpt and illuminate your favorite facial features. 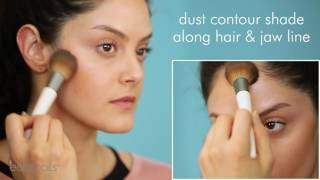 SCULPT: Use the tapered bristles of the Define brush to dust contour shade onto areas of the face you want to define or minimize such as hollows of cheekbones, jawline, or forehead. Apply by tracing the number “3” on both sides of your face. Start at the top of your forehead; sweep down and across the hollow of your cheeks, then dust across jawline. HIGHLIGHT: With the wide fanned bristles of the Highlight brush, gently sweep on highlighting powder to facial features you want to bring forward such as the apples of cheeks, center of forehead or bridge of nose. TIP! 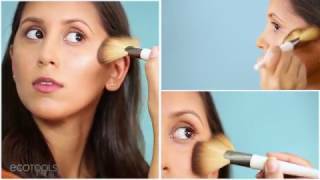 Use a contour shade that is 2-3 shades darker than your natural skin tone.